Keywords: Intergenerational, Transmission, DNA methylation, ELS, Early life stress, HPA. Keywords:Intergenerational, Transmission, DNA methylation, ELS, Early life stress, HPA. Abstract:Early life stress in humans (i.e. maltreatment, violence exposure, loss of a loved one) and in rodents (i.e. disrupted attachment or nesting, electric shock, restraint, predator odor) occurs during critical steps of neural circuit formation. ELS in humans is associated with increased risk for developmental psychopathology, including anxious and depressive phenotypes. The biological mechanisms underlying these potentially persistent maladaptive changes involve long-term epigenetic modifications, which have been suggested to be potentially transmissible to subsequent generations. DNA methylation is an epigenetic mechanism that modifies gene expression patterns in response to environmental challenges and influences mutation rates. It remains to be seen whether a functionally relevant fraction of DNA methylation marks can escape genome-wide erasures that occur in primordial germ cells and after fertilization within the zygote. 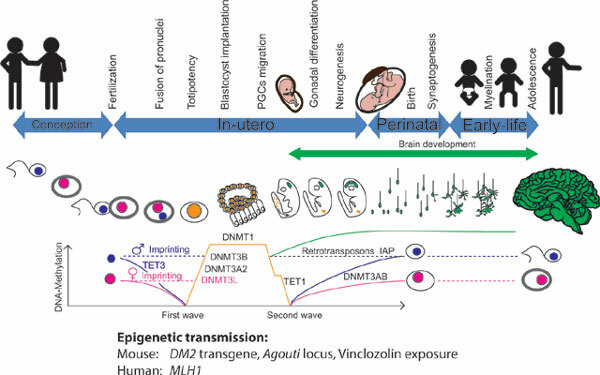 Early life-stress-triggered changes in epigenetic mediated transmission of acquired behavioral traits among humans have been assessed mainly by targeting genes involved in the hypothalamic-pituitary-adrenal (HPA) axis, such as NR3C1 and FKBP5. Recently, researchers examining epigenetic transmission have begun to apply genome-wide approaches. In humans, reduced representation bisulfite sequencing (RRBS) was performed on peripheral samples that were obtained from individuals who were prenatally exposed to the “Dutch Hunger Winter”, resulting in two Differentially Methylated Regions (DMRs) in INSR and CPTIA genes that were functionally, biologically and technically validated, and significantly associated with birth weights and LDL cholesterol levels in offspring. In rodents, non-genomic intergenerational transmission of anxiety which was associated with differentially methylated enhancers that were putatively involved in lipid signaling and synaptic/neurotransmission in hippocampal granule cells, was discovered also using RRBS. Finally, transgenerational transmission of altered behaviors was associated with sperm-derived microRNAs produced by ELS male mice. The field of epigenetic transmission is just beginning to enter the epigenomic era by using genome-wide analyses. Such approaches remain of strong interest to human studies, first in order to help to assess the relevance of the previous targeted studies, and second to discover new important epigenetic modifications of potential clinical importance. New discoveries may help to assess how transmittable the negative impact of stress may be to offspring. The latter may open doors for future treatments and resilience-promoting interventions, as well as new approaches to treat the effects of childhood trauma before the onset of psychiatric disorder.